A few words from us and our customers! Big Blue Greece was founded by Panos Dragounis, an enthusiastic and experienced sailor with local knowledge and a deep respect for the sea. 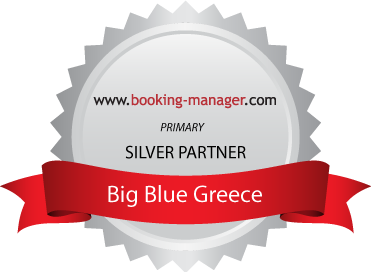 Big Blue Greece is a customer-oriented company with bases in the Aegean and the Ionian seas, offering exclusive sailing holidays around Greece and the Central Mediterranean. We are the only company in the Mediterranean offering a luxurious, safe and comfortable 4-cabin Hallberg-Rassy 49 blue-water cruiser for charter. Big Blue Greece also offers unique custom long-distance sailing trips, which are tailor-made to match the specific needs of our clients. For example, in 2017 we sailed on a private charter from the Ionian island of Cephalonia in Greece to Monaco in the south coast of France, after visiting the beautiful coasts of Montenegro, Croatia, Slovenia, and Italy. S/Y Big Blue is an ideal, safe and comfortable yacht to perform such a special sailing voyage. Feel free to contact us to discuss your own personal aspirations and make your sailing dreams come true! Read below what a few of our customers have to say about us! “We had a most fantastic time on our Greek vacation with Panos! The whole family loved it! There was an emphasis on swimming and eating and sailing. Panos was there to meet us as we got off the ferry and took care of every last detail. His boat is beautiful and spacious. Well appointed and spotlessly clean. We visited remote islands and ate wonderful food. Panos brought us hiking on the islands and was an expert on the local Greek sights. We even took a fabulous cooking class using local herbs, which Panos arranged for us. He is well versed with the waters and an accomplished sailor. In fact you could call him a bit of a perfectionist. “I had the pleasure to sail with Panos for one week in the Cyclades. The cruise didn’t start off as smoothly as I was hoping for because of very strong wind conditions that lasted for a few days. Nonetheless Panos had everything under control. He changed point of departure with no consequences on my side, he wisely postponed the departure and re-arranged the first couple of days to let us discover the beautiful Naxos. When we finally set sail he proved himself to be an excellent skipper, technically capable and very scrupulous with our safety. He knows the Cyclades like his own pockets. Always ready to give hints and recommendations, he took us in some remote spots with almost no one else around but us and he made us discover a few gems along the trip. The boat is simply fantastic, classy, spacious and offers a level of comfort clearly above average. “If you are looking for a relaxing holiday with a great skipper on a perfect yacht, this is what you should choose. Panos has great knowledge of the Mediterranean, he will take you to the most beautiful and isolated anchorages. He will give you all the privacy you want, sometimes it feels like you are alone on your own yacht. He will look after you and make sure you have all you need. For me and my partner it was perfect. “Panos è una persona genuina. Gli abbiamo affidato una settimana delle nostre vite e l’ha tramutata in immagini iridescenti e ricordi indelebili. È uno skipper meticoloso e attento al dettaglio, pianifica il percorso e studia le destinazioni assecondando se possibile i desideri dell’equipaggio. È costantemente impegnato per fare felici tutti, sempre sorridente e ironico. Conosce benissimo il mare greco che solo con un greco si può vivere come abbiamo fatto. La sua barca big blue è magnifica, generosa di ogni comodità, mantenuta in modo incredibile è stata affidabile e confortevole. Ci è stato riservato un trattamento da hotel, grazie alle attenzioni di Laura, paziente e impeccabile, tanto come hostess quanto come compagna di viaggio. Panos, l’armatore di Big Blue, si è mostrato uno skipper perfetto, affidabile ed instancabile ed un attento pianificatore. Ma Panos non è solo uno skipper: con la sua parlata arguta e colta ci ha raccontato i segreti, la storia passata e attuale di questa terra, legata alla nostra da 2000 anni e ci ha fatto appassionare ad ogni nuova destinazione e scherzare in ogni lingua. Laura è una hostess impeccabile che intuisce ed anticipa ogni tua necessità, fornendoti la soluzione in sordina ancora prima che tu gliela chieda. Grazie al lavoro di Panos e Laura quello che sembrava un equipaggio di fortuna, nato per caso, si è trasformato incredibilmente in una squadra affiatata a caccia di vento, di fondali, di approdi. Se avrete la fortuna di stare al timone di Big Blue sentirete nelle vostre mani l’anima di questo splendido scafo, non solo confortevole e ben attrezzato ma oltremodo sicuro e potente.